“Please listen to me” or “Please let me complete” are common requests in our day-to-day conversations. It is not uncommon to be in a meeting where you feel that the other person is just not listening to you. In fact, you start wondering if anyone is listening to anybody else. But don’t be surprised if the person on the other side is also feeling the same way about you. All of us have an agenda and we are all focused on driving that agenda. Is it possible that we are witnessing an empathy deficit everywhere? I don’t know. 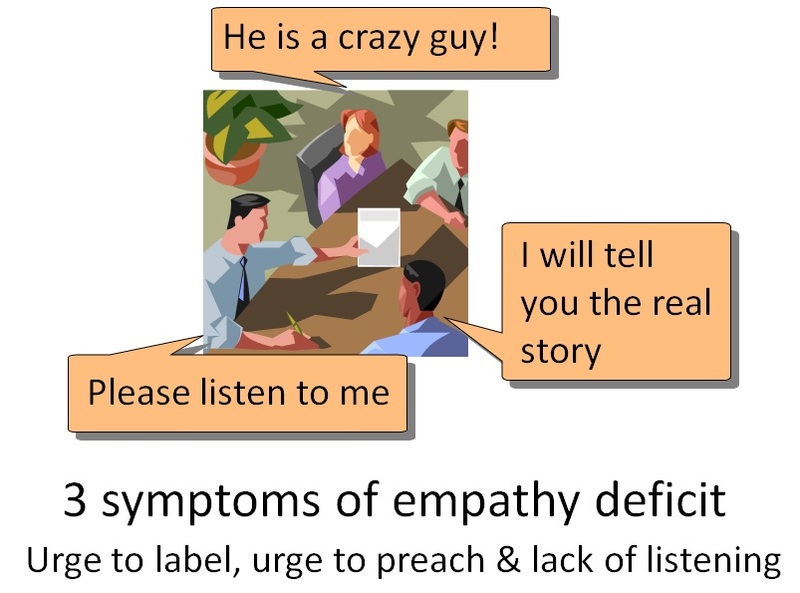 But in this article I would like to present three symptoms which I feel indicate an empathy deficit. Urge to label: Whether it is the drivers on the street or the teachers in the school or the colleagues at work, we carry an urge to label them. We are convinced that they are doing something obviously wrong or crazy. However, one thing gets lost once we label someone or something – our ability to learn more about that something or someone. Empathy is primarily about accessing our own ignorance. And when we approach a situation from “I know it already” perspective then it leaves little opportunity for us to access ignorance. Thus urge to label indicates lack of empathy. Urge to preach: Sometimes we take on a mission – say of sustainability. And then everybody whom we come across as careless about environment e.g. waste management becomes a candidate for preaching. We start giving sermons on A-B-C of sustainable living. If I am lucky, the other person listens to me. However, more often than not, these unwarranted sermons are received with apathy and pain-in-the-neck reaction. And that is not surprising because a sermon is being delivered without understanding the interest of the listener. Thus urge to preach indicates lack of empathy. Lack of listening: Listening is such a common experience. However, quality of listening can be very different in different situations. Moment I hear something I don’t agree with, a voice in the head gets triggered and it generates so much noise that it is very hard to actually listen to the other person. This is especially true when the topic is close to my heart – say my religion or my favourite idea or even my car etc. 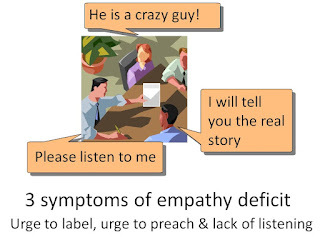 Urge to label or preach or lack of listening are easier to observe in others. However, it is quite powerful if one can observe it in oneself. This may be the beginning of accessing the illusion we have been living under all the time. Why don’t you try and test?